I have one of the sweetest cousins ever. She was ordering stuff from Avon and got me two polishes plus some nail rhinestones for no reason at all (well, other than she knows how crazy I am about nail polish :D). One of the polishes is this one named Violetta Sparkle. 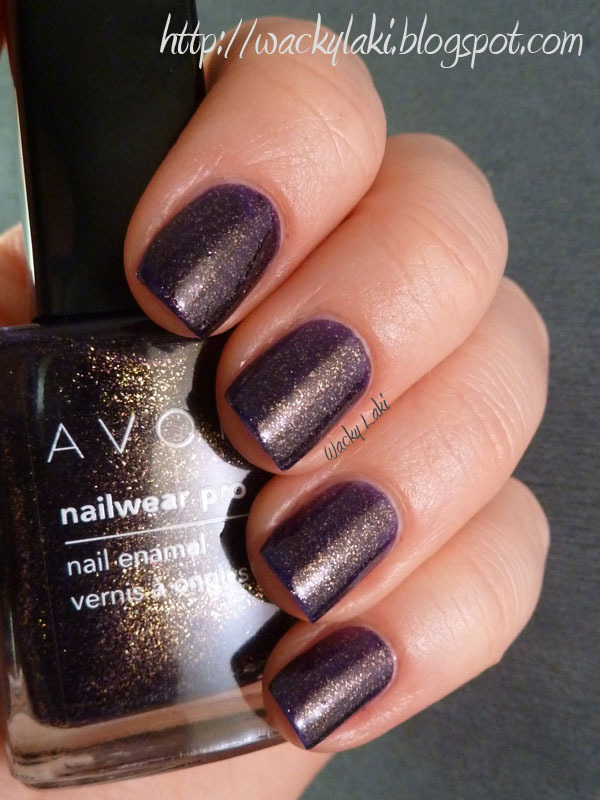 It is a dark purple base with golden copper flakes. A really gorgeous polish and perfect for this time of year. This is the first Avon polish I tried and I can officially say that I'm impressed. Have you tried Avon polishes before? wow this one looks very pretty! Wow, that is a gorgeous color! Wonderful polish, I love these golden flakies!!! This is a stunning polish! I ordered this from my Avon girl and they shipped the wrong polish, so I have to wait a while to get it. Grr! Oh well, at least I get to keep the other one. Anyways, this looks amazing on you! Way to go Avon. The worst part about these brands is having to buy by catalogue. Well, Avon does have a few stores, but not many. Wow! I love that gold shimmer! This was my 1st time trying Avon too. I was really impressed with the quality and love the color. I'm glad that all of you liked it too! The color is beautiful in pictures, i can really see the purple. Enjoy! They look great on you! Can't wait to play!